If one of your New Year’s resolutions is to spend less time on email, then here’s a handy, $.99, iPhone app called Tout. It's an email productivity tool that tells you who has read and who has opened messages you’ve sent. Once you send out email using Tout, you can instantly check whether your email have been opened using a tracking screen, provided the recipient is online. It's worth noting, too, that just because someone has opened your message, that doesn't mean they haven't promptly trashed it without reading. Tout was designed mainly for email templates, so can create thank you notes, contact info messages, business introductions, or any other sort of email you want to send to a large number, with an easy interface to let you send again and again. Don’t want to send someone an email at 5pm on Friday when they probably won’t read it? 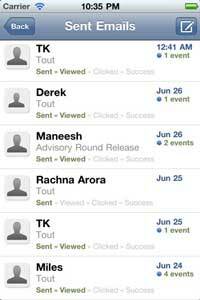 Tout also allows you to schedule emails to sending off later on. If you're itching for a test drive, there’s a free web application that for Google mail users that will analyze your 2011 emails and give you a handy report. It takes a couple of hours, but at the end you'll find out if you're tossing your carefully-composed messages into a black hole of indifference.